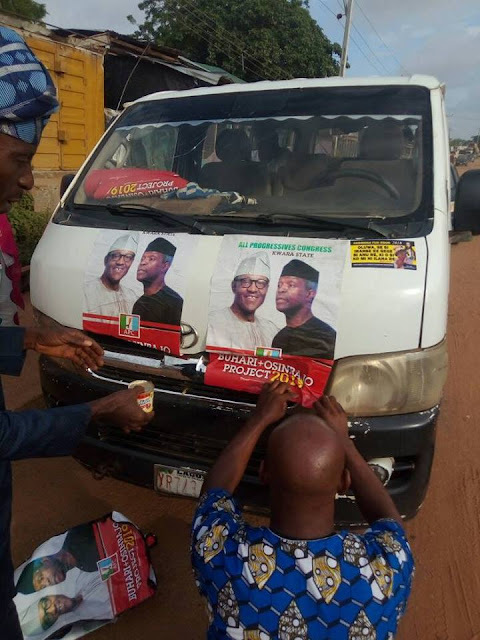 Home / Politics / RE: "Angry Lai Muhammed, MMM Supporters Tore Buhari Osinbanjo Posters To Protest Shut-out From Apc Convention"
RE: "Angry Lai Muhammed, MMM Supporters Tore Buhari Osinbanjo Posters To Protest Shut-out From Apc Convention"
The attention of the Kwara APC has been drawn to the fake News trending on the social media that "Angry Lai Muhammed, MMM Supporters Tore Buhari Osinbanjo Posters To Protest Shut-out From Apc Convention". We will advise the rumor spreaders and the rumor mongers to desist from carrying fake and counterfeit information. The picture above shows how the authentic Kwara APC were preparing for their movement to Abuja yesterday at Garage Offa, ilorin. Please ask the wailers how Garage Offa resemble Eagle Square. Therefore kwarans should disregards the above allegation because it is malicious.